Kingston, Jamaica, January 23 The Development Bank of Jamaica (DBJ) and the Jamaica Stock Exchange (JSE) today (Wednesday, January 23rd) signed a Memorandum of Understanding (MOU) for the development and delivery of a series of Alternative Investments Certificate courses and workshops for professionals in the capital markets. 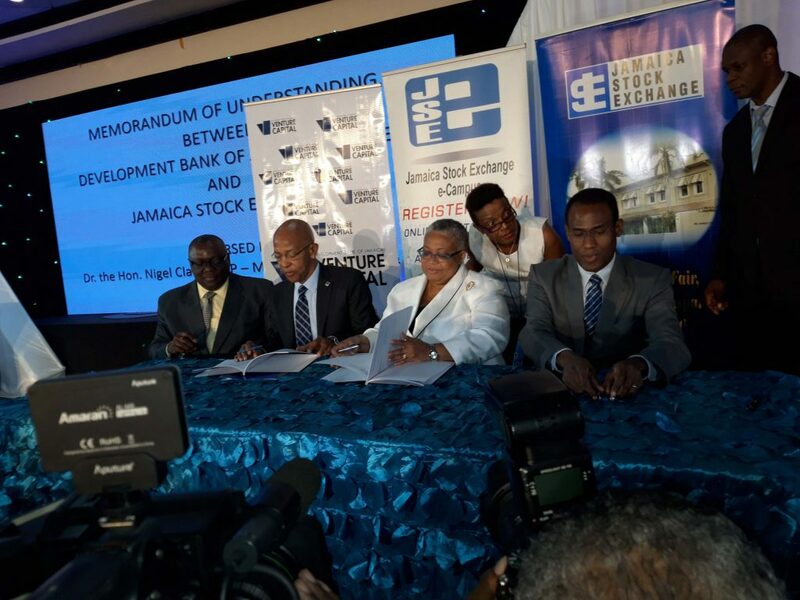 The signing took place at the JSE’s 14th Regional Investment & Capital Markets Conference, held at the Jamaica Pegasus Hotel. Audrey Richards, Project Coordinator of the Jamaica Venture Capital Programme (JVCP), under whose portfolio the MOU was created, states: “It is to be noted that private equity, as an asset class, has increasingly gained traction on the local landscape, with entrepreneurs and local businesses becoming more receptive to equity financing as an alternative source of funding. This is significant when taken against a previously debt-centric environment. The MOU will see the JSE, through its eCampus, developing a series of standardized certificate programmes targeting stakeholders within the capital markets. Two distinct courses will be offered – Beginners Guide to Alternative Investments (basic) and Alternative Investments for Professionals for the intermediate level. Milverton Reynolds, Managing Director of the DBJ, explains: “Jamaica’s Stock Exchange has been rated amongst the best in the world, and we, at the DBJ are proud to be partnering with the JSE as we seek to build the knowledge level of all markets stakeholders within this emerging industry. The training programmes are to be delivered in a blended format which includes face-to-face and online sessions through the eCampus portal. The first workshop is scheduled for February 5, 2019, at the Knutsford Court Hotel in Kingston. More information, including registration forms, can be accessed through the website www.jamstockex.com.